Preheat oven to 375 degrees. Spray a 9×13-inch pan with cooking spray. Whisk together cream, eggs, salt, onion flakes, pepper and nutmeg. Stir in ham, 1/2 cup swiss cheese and 1/2 cup white cheddar cheese. Add cooked pasta to mixture and pour in prepared pan. Cover with foil. Bake for 30 minutes. Remove foil. 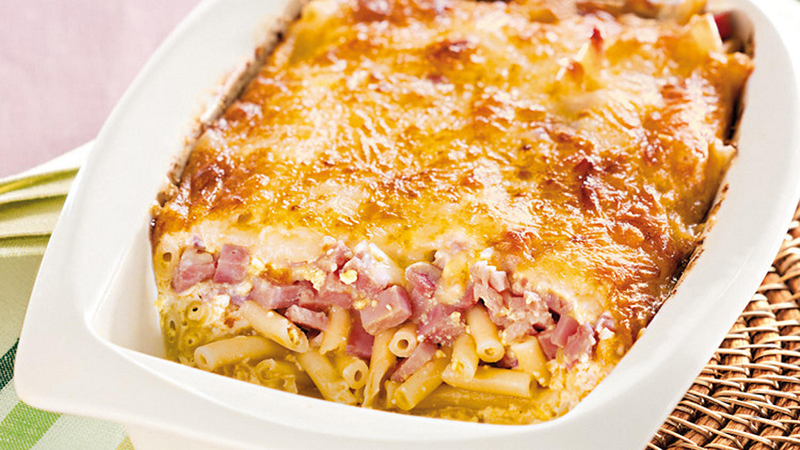 Top with remaining cheese and bake for an additional 15 minutes.